Here are the ad visuals for the Three Winter Stardust holiday coffret (8400yen) which will be released on 13 November in Japan. 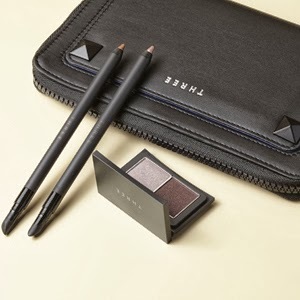 The set includes Flash Performance Eyeliner Pencil 09 Child of the Moon and 10 The Prettiest Star (feminine lavender silver and shimmery copper gold), and Blend Eye Color Palette Duo 06 Winter Love (greyish lavender and red-toned purple). Three will also release a skincare Special Kit 2013 (10500yen) on 27 November. It includes Balancing Cleansing Oil 200ml, Balancing Cleansing Foam 30g, Balancing Cleansing Lotion 30ml, Balancing Cleansing Emulsion 28ml, Balancing Cleansing Cream 8g, Conditioning SQ Oil 2.5ml, Scalp & Hair Balancing Shampoo 50ml and Conditioner 50g. Do you know how I could purchase the Three Holiday 2013 Winter Stardust Kit and the Suqqu Holiday Kit B in the US? Any help you can provide would be appreciated! Thank you! Selfridges.com may stock the Suqqu set and they ship to the US. You can try calling the counter directly to enquire when they will get it. As for Three, perhaps you can try Ichibankao.com to see if they can do a custom purchase for you. Their prices are high but they are reliable with fast shipping.